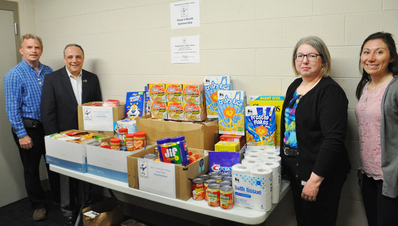 Clifton Forge, VA (April 4, 2019) - The Virginia Community College System's Shared Services Center, located in Daleville, recently made a generous donation to the "Cubby Closet", a food bank hosted by Dabney S. Lancaster Community College. The non-perishable items, donated by the group's administration and staff, included cereal, soup, canned goods, peanut butter and bath issue, among many others. Accepting the donation on behalf of DSLCC were Billy Ould (far left), who serves on the Cubby Closet Committee, and DSLCC President Dr. John Rainone. On the right, representing Shared Services were Pamela Roberson (left) and Sarah Everett. Donations to the Cubby Closet are graciously accepted; contact Phyllis Bartley at (540) 863-2824 or email pbartley@dslcc.edu for more information. Donations may be dropped off at any time outside the Cubby Closet door, located in the Armory on the DSLCC Clifton Forge campus.